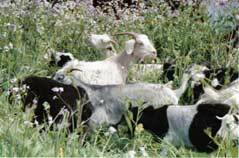 Goats R Us is a family owned and operated grazing company. Established in 1995, our livestock are used primarily for fuel mitigation and the eradication of undesirable plant species. We provide communities with environmentally friendly vegetation management as well as public education about alternatives to traditional abatement techniques.